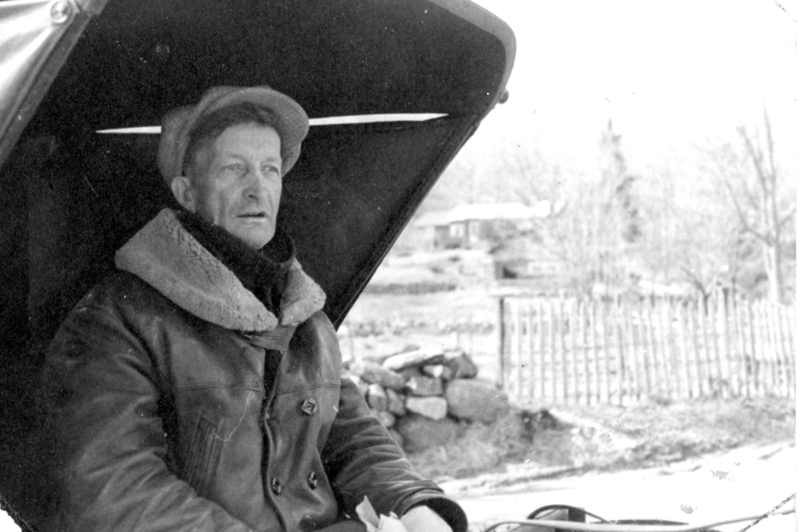 Cover photo: Edgar Seaver (1880-1978) delivering the mail by horse and buggy to Tolman Pond, 1939. Edgar brought the mail and the news for nearly half a century – a quick drop and a chat, then off in a cloud of dust to his next stop. There were complaints from some who declared him a menace on the road when he had to make up for lost time. Edgar took pride in his delivery vehicles and filled the back seat to look like an official post office on wheels, with a rack of inkpads and stamps, empty mailbags marked Special Delivery and Air Mail, and a basket for postage-due letters. Inside Cover: Robert (Bobby) Curtis (1932-1989), whose family had a farmhouse on the land where Elizabeth Hewitt and others now reside on Henderson Road, spent his adult life working as a handyman. Short, stout, strong, and steady as a rock, he persisted until the job was done. Proud of his brawn, he was known for cutting holes in the ice for a winter’s swim and trying to out-muscle King and Queen, his draft horse team. Here he is getting in the wood – 35 cords – for a lucky homeowner. Bobby eventually owned the biggest chainsaw in town. 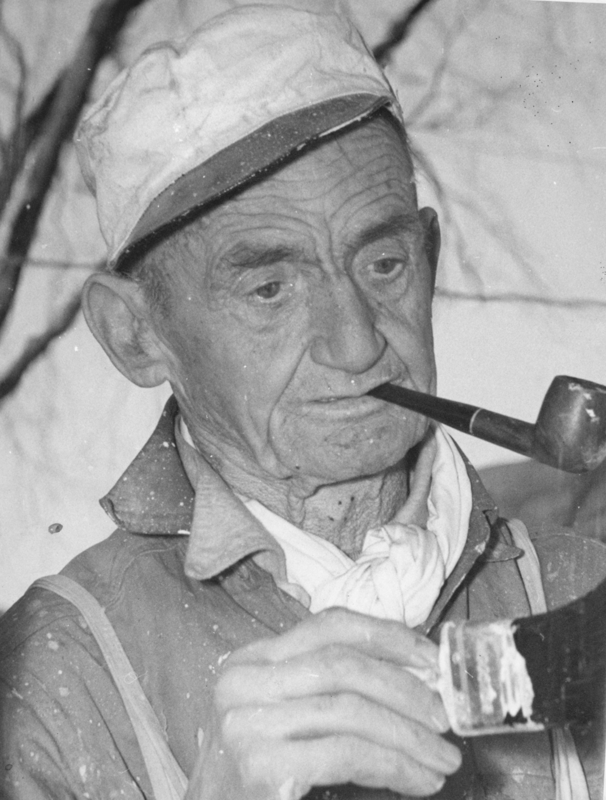 January: Edgar Poland (1909-1986), originally from Munsonville, was an itinerant “woodchopper” and “porcupine hunter.” In his later years, he lived in a small camp down the hill from the Gerbis house in Nelson village. For many years, Edgar, Nelson’s dump tender, travelled by bicycle to and from the dump, just off the road to Harrisville. One year Edgar bought a puppy, Crackerjack, who became his best companion. Crackerjack proudly rode in Edgar’s bicycle basket. As Crackerjack grew, Edgar was no longer able to peddle his bicycle, so he simply pushed it to and from the dump, with Crackerjack riding in the basket. Neither of them ever missed a day of work. February: Ralph Page (1903-1985) of Munsonville held a number of full- and part-time jobs and played guitar at local dances. On December 6, 1930, he arrived to play at the Stoddard dance when the caller, Harry Frazier, developed laryngitis and informed Ralph that he would have to take over. 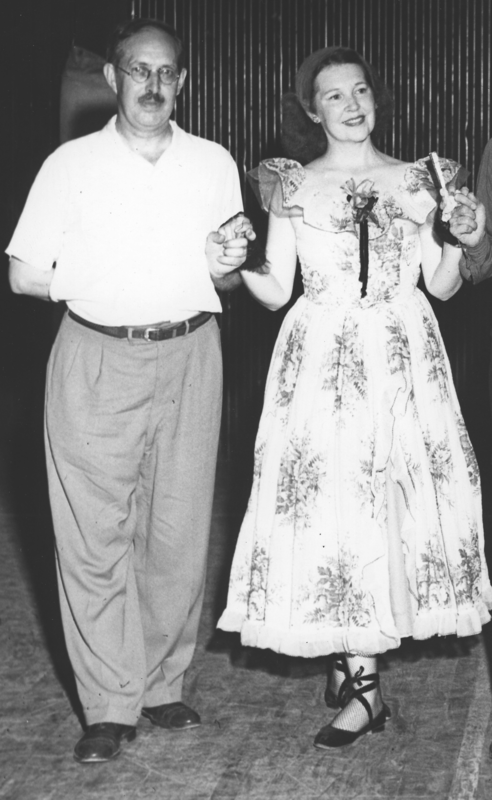 Though that night has been described as a “disaster,” Ralph continued to call for the next 54 years, pursuing his chosen occupation with such single-mindedness and application that he became one of the leading callers of his time and an important figure in the history of traditional dance in America. 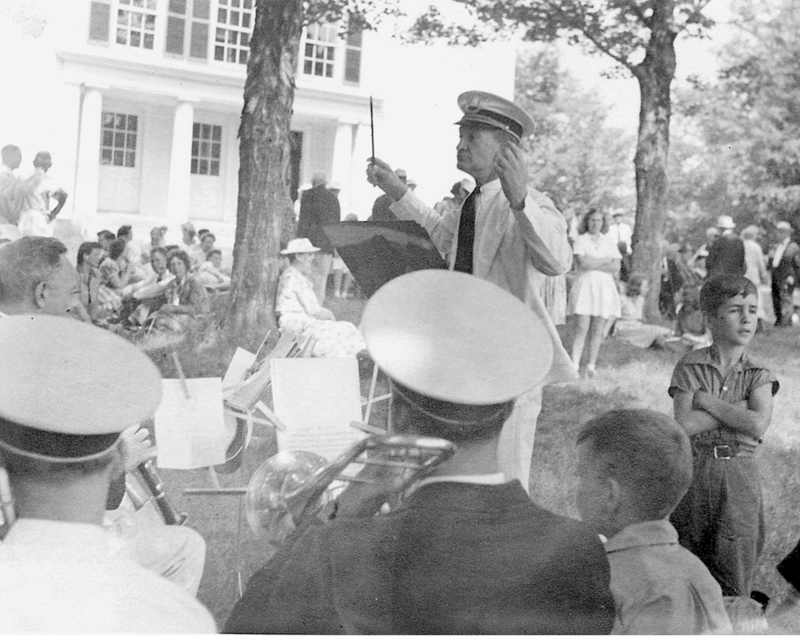 In 1977, Ralph Page received the Granite State Award, which acknowledged not only his talents as a caller and musician, but also his contributions to community life both as a selectman for Nelson (1932-1938) and as president of the Historical Society of Cheshire County for 15 years. March: Charles William French (1873-1948), the brother of Sarah French Tolman (known as Sadie or “Ma” Tolman) and the father of Winston H. French, worked at Tolman Pond and at times at the Farwell farm (then owned by Win French’s future father-in-law). Uncle Bill, as he was called, always dressed in bib overalls, a tie, and a hat, and often sported a feather in his cap. He carried peppermints in his pocket to give to children. He was the epitome of a farmer, with big and rugged hands that were adept at mowing, haying, milking, delivering ice, tending the land, caring for farm animals, and keeping a working farm self-sustaining, if not self-supporting. Here he is tapping some maple trees, getting ready for the sugaring season. 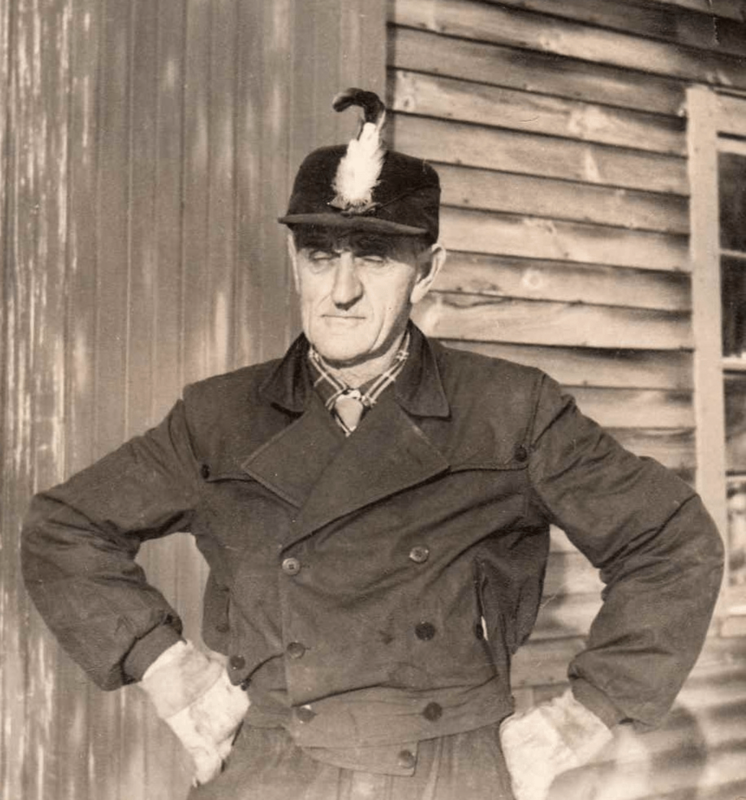 Bill French with a feather in his cap, in front of the Tolman Pond farmhouse barn. April: The Barretts have lived and farmed here since the early 1800s. 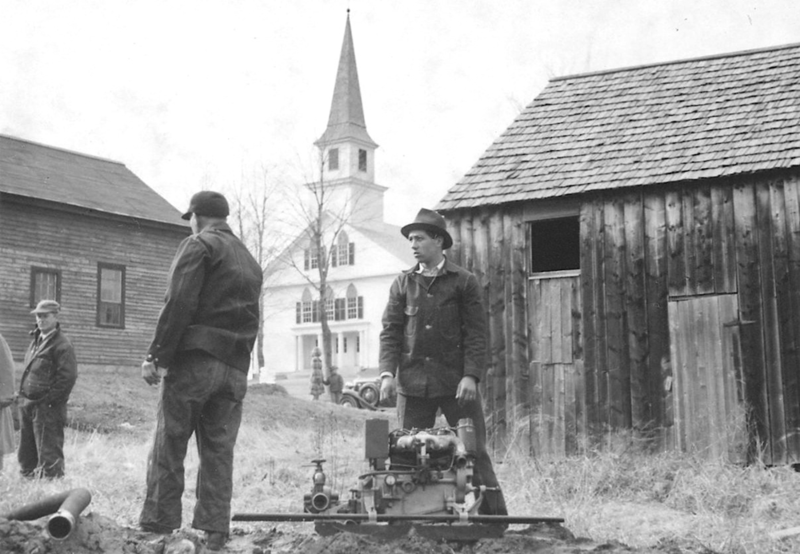 The first Barretts in town came from Townsend, Mass., and Mason, N.H., after the Revolutionary War. They settled in the northeast corner of Nelson and also on land west and south of Granite Lake. 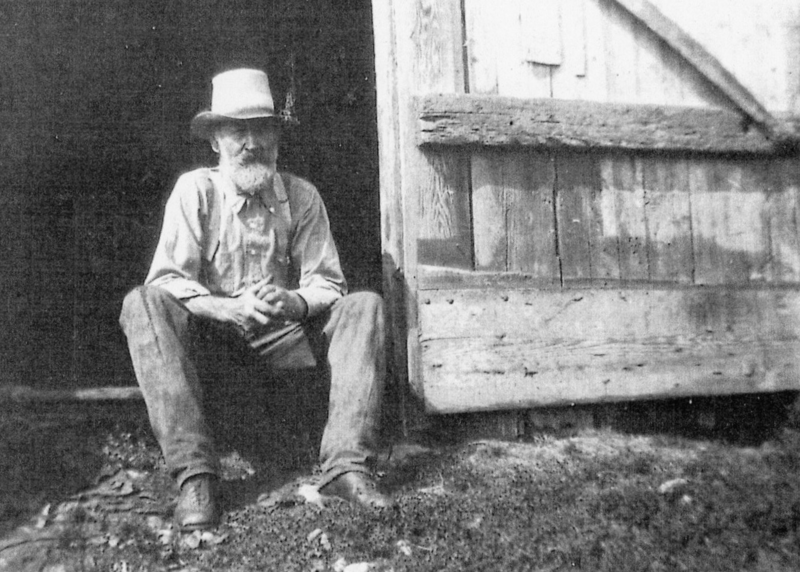 William Wallace Barrett (1837-1882), who fought in the Civil War, owned a house and lot just south of Granite Lake. 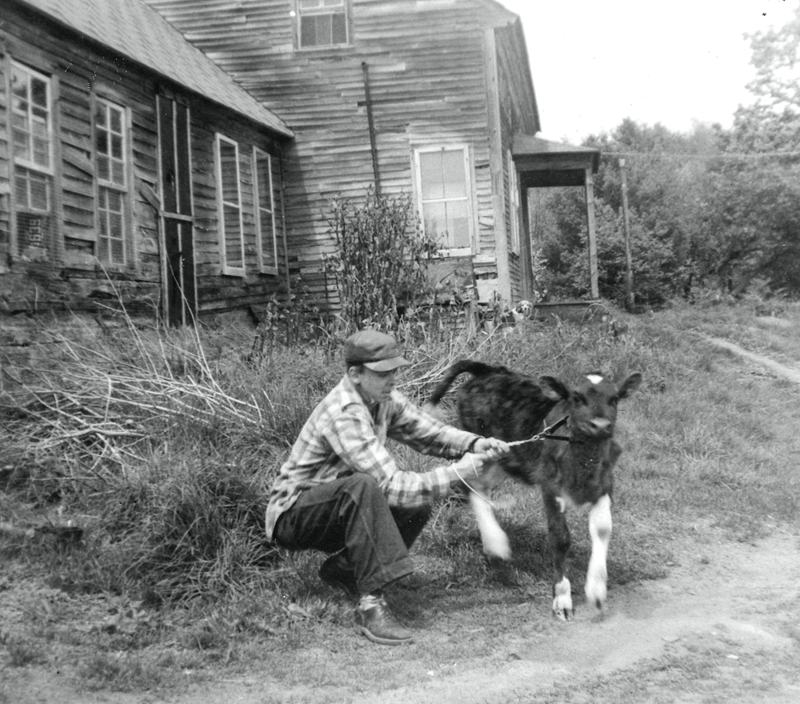 He married Caroline Powell Jenkins and they had 12 children, one of them named Wilmer; Wilmer had a son Earl, whose son Wilmer (1933-2007) is seen in this photo with a newborn calf. 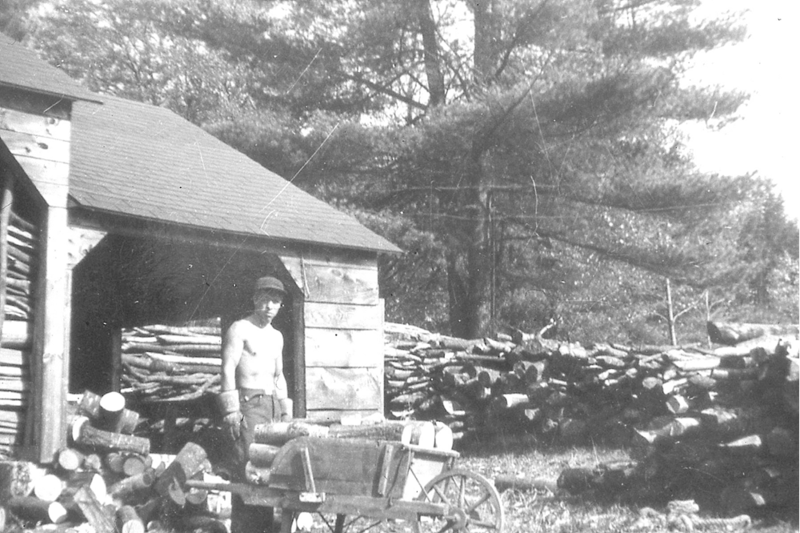 Wilmer’s son, Nick Barrett, continues the family farming tradition to this day, raising animals and producing excellent maple syrup at his farm on Old Towne Road. May: William Orville Upton (1840-1922) was born in Stoddard, the son of Daniel Upton and Mary Robb Upton. He served in the 1st NH Cavalry, Company A, during the Civil War. William first married Emma Scott, who died without children, and then married Sarah Yardley, whose parents owned a house on Nubanusit Lake. He and Sarah had two children, Frank and Horace. He and his family ultimately settled the Upton homestead on the Old Stoddard Road, a half-mile north of Nelson village. William was a wheelwright, a farmer, and Nelson’s road agent for a number of years. Near the end of William’s life, he was hospitalized in Keene. After a couple of days, his son Horace got a call that William had walked out of the hospital. Horace went to Keene, and after a time searching, found his father sitting on a park bench in Central Square, in much the same fashion as he’s sitting here beside his barn door. He refused to go back to the hospital, so Horace took him home to Nelson, where he died. June: Win (1914-2000) and Dot (1920-2011) French could be counted on for action on most anything that might come up in the village – anything that needed to be found, answered, accounted for, or helped with. Among other offices, Win served notably as cemetery sexton and postman, and Dot as a trustee of the library. Dot lived her entire life in the home she was born in on Center Pond Road, where she raised her family, mothered baby lambs behind the wood stove in the kitchen every spring, tended her grandchildren after school, and worked in her gardens. Win maintained a tradition of bartering, keeping all his transactions in a little notebook. He was even known to pre-barter by delivering wood or some service that had not been ordered to someone he planned to ask for a favor. 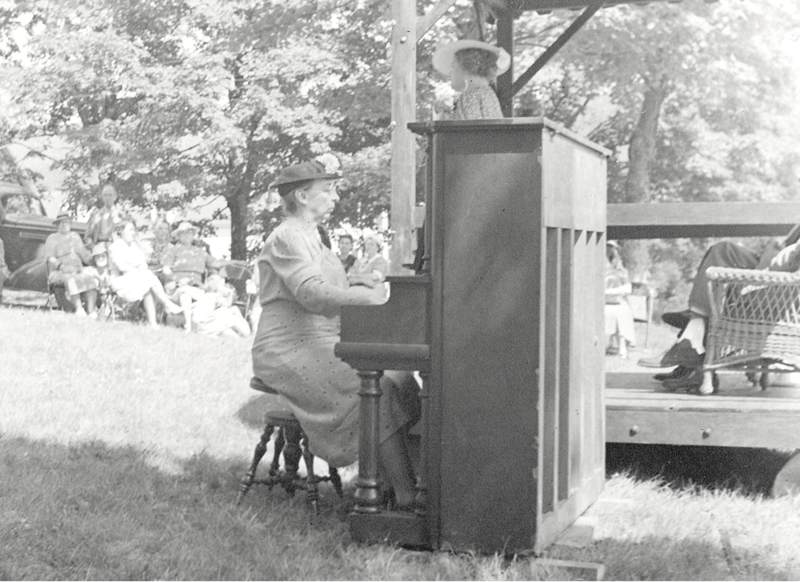 July: Bessie Hardy Lyman (1882-1981), the oldest daughter of Nelson’s Reverend Millard Hardy, was as upright in character as the piano she played at this Old Home Day picnic. A 1910 letter of reference for a teaching position described Bessie as “a musician of ability, a tactful teacher and a young lady of splendid character.” She taught children in Nelson so she could pay for piano lessons in Boston, then went to Turkey as a missionary and started the music department at Central Turkey Girls College. In 1953, after nearly 40 years as a missionary, Bessie came home and became the Congregational Church organist, still upright and able to make the old reed pump organ sound perfectly melodious. August: Edgar Seaver (1880-1978) was more than the Nelson mail carrier (see cover photo). Standing tall in a cap and gold braid, he was also the conductor of the Nelson Town Band, which he had organized. Edgar could play all the shining band instruments in the collection at his home in Harrisville, and sometimes visitors to his farm were rewarded with a fine solo. Edgar was a farmer and a landowner. He leased lots to summer tenants on Silver Lake, and also sold them milk and eggs. It is said that his chickens were free to use the main staircase to the second floor of his house to lay their eggs, which made gathering them much easier for such a busy man. September: Jack Sherrard (1878-1975), an Englishman, was a seafaring man who traveled the world on merchant ships out of Australia. How did he find his way to Nelson? It seems his last voyage ended in New York City, where he met a man who suggested he could live out his days in the peace and quiet of Nelson. He left the sea and the tall ships for the canoes and sailboats of Camp Oahe on Granite Lake, but he brought his memories with him. Jack told exciting tales of his life at sea and exotic places he’d visited. 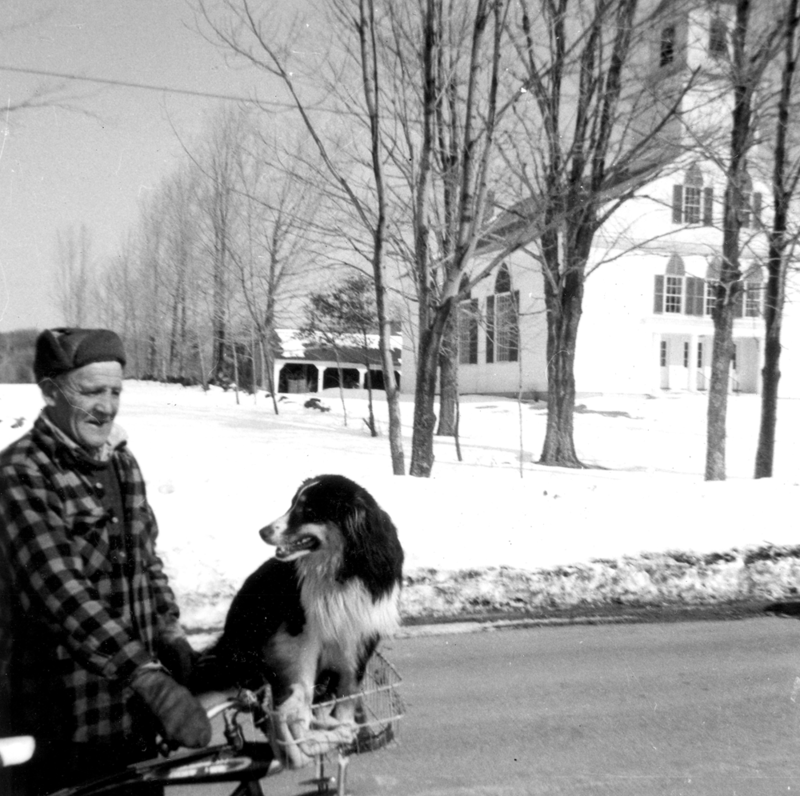 His recorded sea stories, chanteys, and songs can be found at the American Folklife Center at the Library of Congress in Washington, D. C.
In his spare time, Jack raised rabbits and painted houses, using any leftover paint to decorate his house and rabbit hutches, then visible from old Route 9 south of Munsonville. October: Fran Tolman (1902-1969), who lived at the family homestead on Tolman Pond, never turned down the opportunity to pose for a photograph, thinking that a “postcard” would help attract some business. Fran was a successful upland game guide who, it was said, had the “best natural upland game wing shot” around. 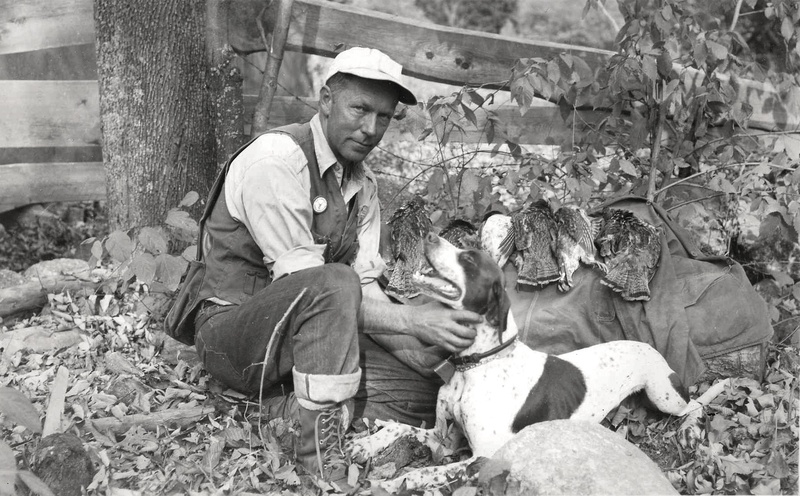 He trained his bird dogs for the sport and attracted hunters from far and wide. His hunting clients stayed at the farmhouse on Tolman Pond, where they were further entertained, fed, and pampered – ready to head out the next morning to hunt the area’s favorite bird covers. 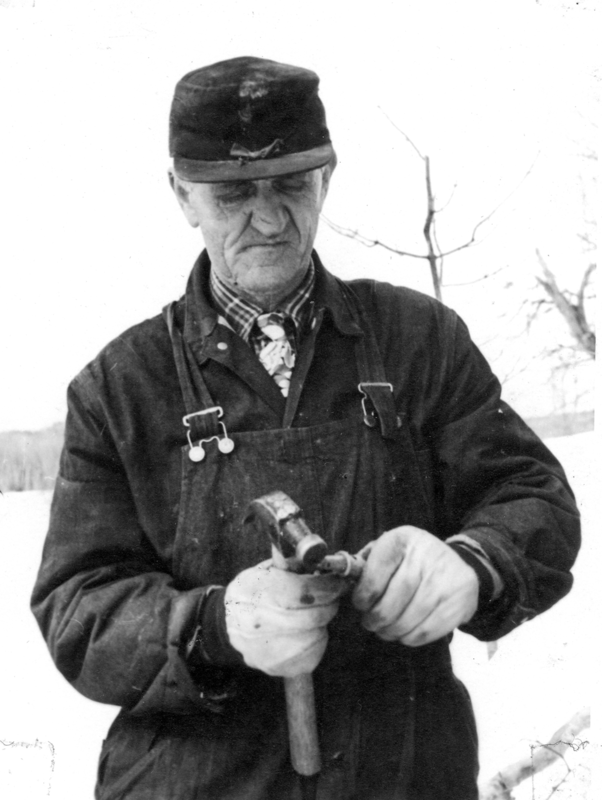 November: Frank E. Upton, Jr. (1920-2006), who lived on the south end of Nubanusit Lake at Flying Loon Farm, was a master mechanic who could fix anything – airplanes, pumps, furnaces, cars, trucks, tractors, lawnmowers, sawmills, bulldozers, and anything else that relied on moving parts. He was the only one who could make this recalcitrant four-cylinder pump run. 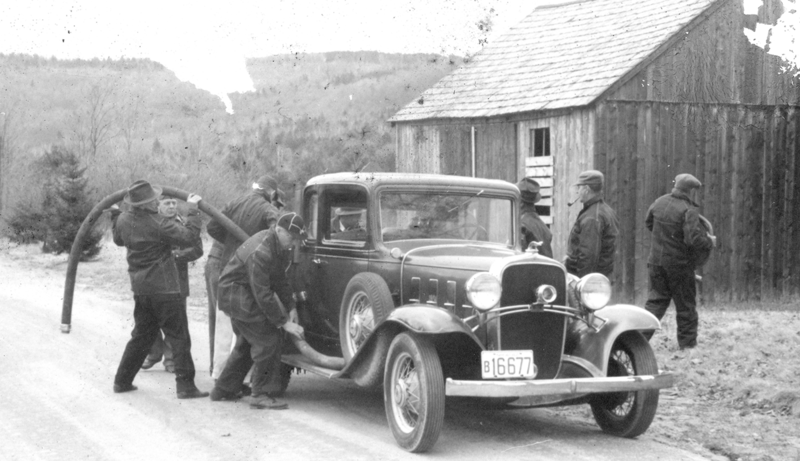 The pump was retrofitted to sit on the back of Nelson’s first fire engine – a 1929 Chevrolet coupe donated by Catherine Robinson – as seen in these photographs. 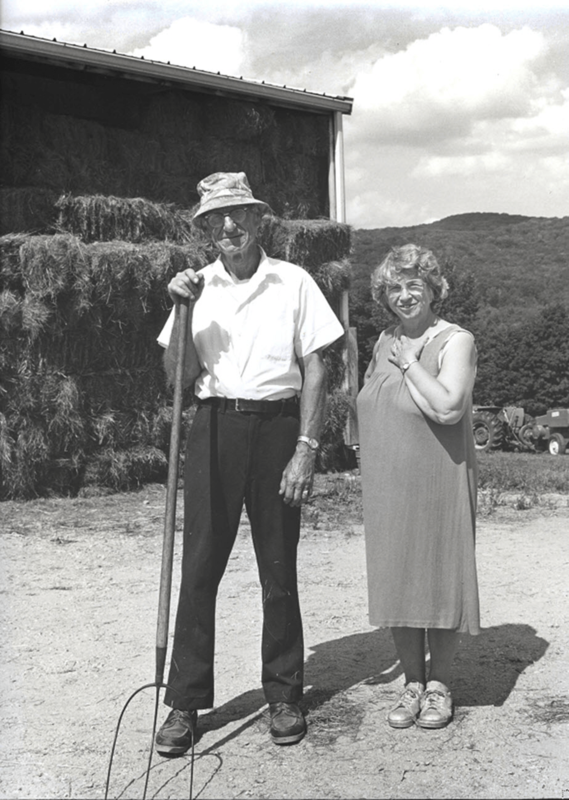 December: Newt (1909-1986) and Janet Tolman (1909-1982) lived at Greengate, their home high on the hill above Spoonwood Pond. Newt was an extraordinary athlete and an avid skier who helped to develop the ski hill (one of the first in New Hampshire) at Tolman Pond, where for many years skiers came to enjoy the sport. 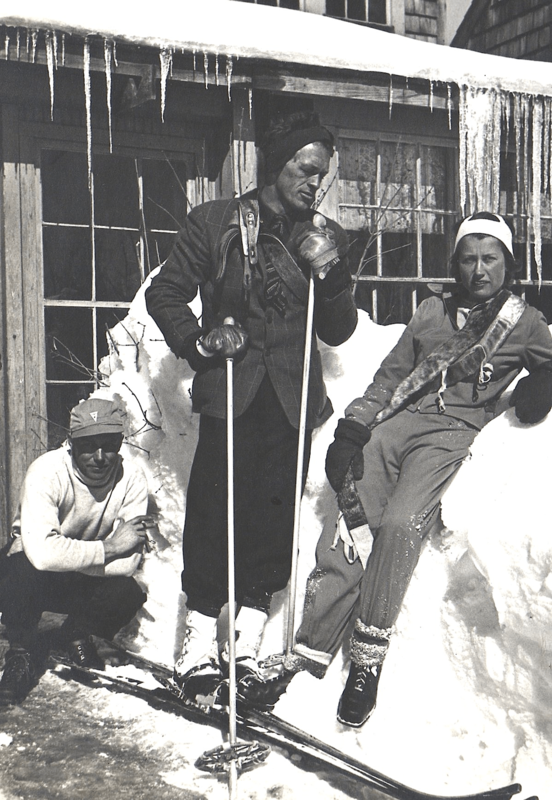 Newt not only gave lessons, he made hardwood skis with patented metal edges made from bronze clock springs, patented “stepped” skis (steps carved into the bottoms of the skis) to facilitate climbing up hills, and also developed a technique known as “figure skiing” – using the double-ended skis that he also made. Janet, while she certainly enjoyed skiing and hanging out with the skiing guests, spent much of her time guiding upland game hunters and training and boarding bird dogs. She also served as a state representative in Concord, gave art lessons, and was an accomplished fine arts painter. Here Newt (center) and Janet are posing in front of the Ski Room at the farmhouse at Tolman Pond. Even though we don’t recognize the people in this photograph above, cutting and getting in the ice was a huge winter occupation before power and refrigeration became available. 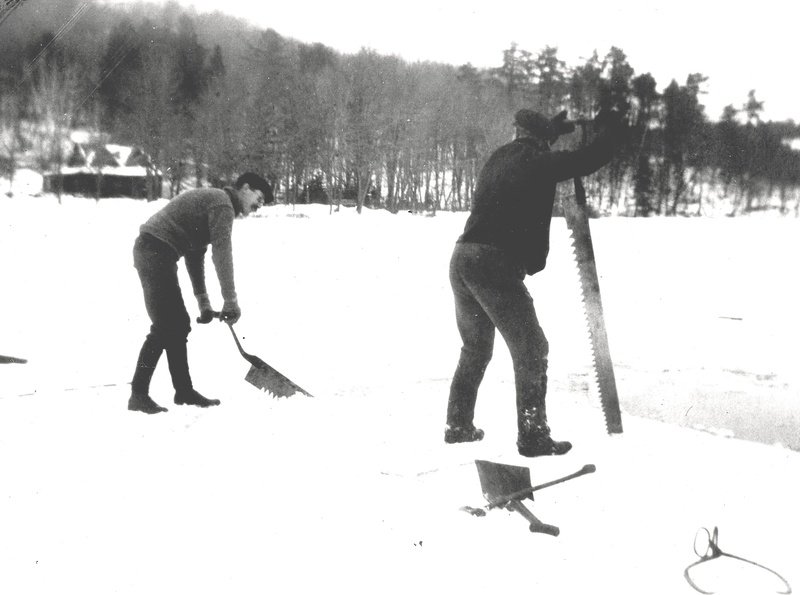 This photograph, taken on Tolman Pond in the early 1900s, shows two men sawing up big squares of ice, getting them ready to harvest. 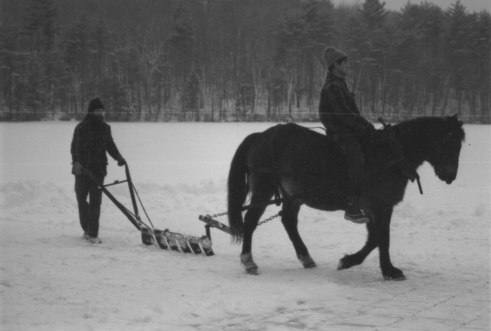 Above left: Guntram Gudowius guides the ice plow, with Michael Iselin on the horse. Right: George Iselin loads the sled. Below left: The ice plow cuts down about three inches to create a grid of blocks. Right: Michael Iselin fills the icehouse. 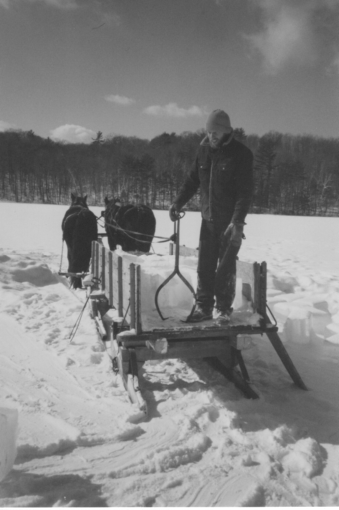 In the 1980s, Michael and Alouette Iselin decided to seek an alternative to using electricity, so the family, with the help of many friends and a team of horses named Frank and Queenie, revived the old ice-cutting skills. 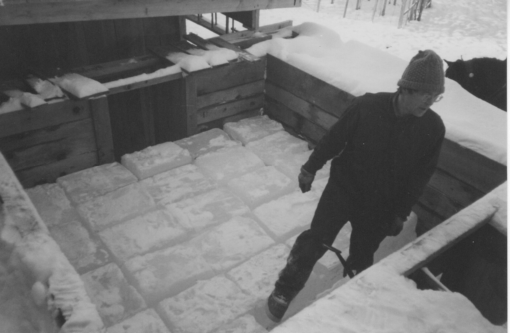 They cut ice on Center Pond each winter and stored the massive blocks in the double-walled icehouse on the north side of their house on the pond. Like haying or sugaring, ice harvesting must be done when the conditions are exactly right. Once a good layer of ice forms, the area to be harvested must be shoveled or plowed after each snowfall to keep the ice clear, until the ice is about 16 inches thick. This could happen anytime between late December and the end of February. 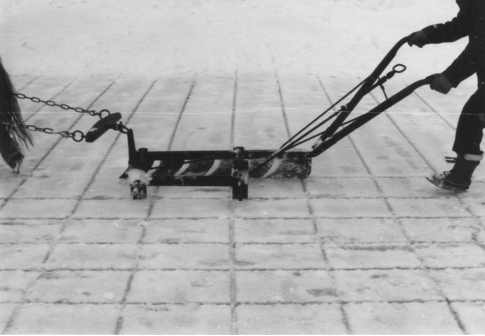 The Iselins used a horse-drawn “ice plow” to score the ice into a grid about 12 inches by 20 inches. The scored blocks were cut with a large-toothed saw, floated to shore, and lifted with ice tongs onto a sled. Each block weighed about 100 pounds. The Iselins put up 100 blocks, or about 10,000 pounds of ice, each year, enough to cool the icebox and make many batches of ice cream. These photos (above right) were taken in 1985 by Guntram Gudowius.